Erna Solberg is the party leader of the Norwegian Conservative Party (H). She has held this position since 2004. She has represented the Hordaland region at the Storting since 1989 and held one of the Minister posts in Bondevik's 2nd Government coalition from 2001 to 2005. The Conservative Party is a wild card at the 2009 election since they could be liable to enter a coalition with either the Labour Party (AP) with Jens Stoltenberg, or with the Progress Party (FrP) with Siv Jensen. A coalition with the Labour Party is a political paradox but not an impossibility if you consider that Solberg and Stoltenberg both are born in the sign of Pisces. In addition they both have their Moon's in the sign of Gemini, so they could have the ability to pull for a common ground. However, the chart comparison between Siv Jensen and Erna Solberg is highly interesting. Siv has her Sun opposing Mars, while Erna has her Sun opposing the other warrior planet, Pluto. The women's Moons are in compatible signs and the planet Venus holds almost the same position in both charts. 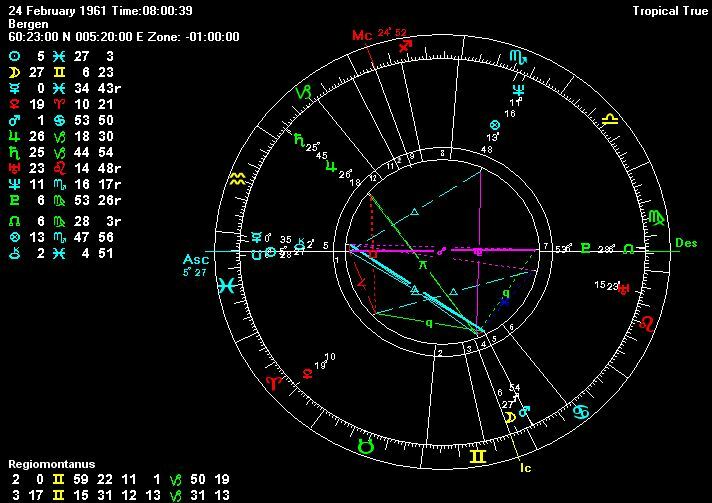 Both women have a retrograde Mercury combust the Sun, which could show an attempted but not lasting coalition.